pssmitty papercrafts: Time for an update! 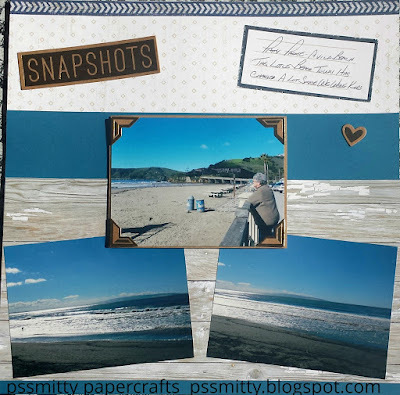 I'm catching up on some of my scrapbooking & decided it's time to update my style! So I'm going to share some of my tips with you. Mix your colors! Break up the background! Add some gold! Handwrite your journaling! Crop your photos to highlight what you want to stand out! This layout was a lot of fun to do as I incorporated all of those tips. The tile art wall is mounted on green cardstock. The breakup of the background papers matches the backgrounds of my beach photos. The painted cow was actually in the background of the art wall picture until I cropped the photo, then I cropped it again to highlight the cow and mounted it on the gold trimmed tag. 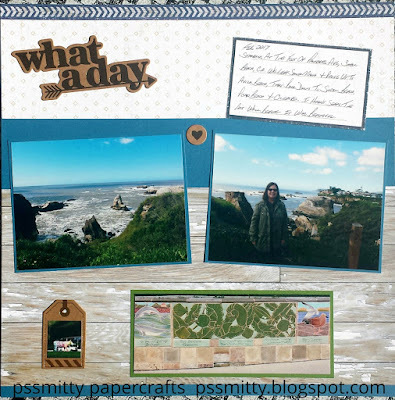 My journaling follows the page title by describing where the photos were taken and talking about our day. In the 2nd page of my layout you'll notice I've highlighted the picture of my friend with the gold accent corners and I've mounted the photo on the page with foam tape so it stands out from the other photos.